Anti wind turbine campaigner Susan Crosthwaite is calling for an immediate and full independent investigation into the pollution of surface and groundwater of ALL Scottish windfarm developments sited on River Basin Districts. It has been revealed that the construction of giant wind turbines has led to the industrialisation of water catchment areas damaging water quality and public health. She demands that relevant legislation be adhered to vigorously to ensure complete protection of Scotland’s reservoirs, lochs and private water supplies can be restored. “Windfarm development in Scotland is clearly breaching The Environmental Liabilities Directive and the Water Frameworks Directive. Developers and government bodies have allowed these developments to proceed in the full knowledge that there are risks to surface and groundwater. Authorities such as SEPA, Scottish Water, Councils and the Scottish Government have failed in their legal duty to protect the water environment. Public authorities should ensure the proper implementation and enforcement of the scheme provided for by this Directive. “People wonder how windfarms can possibly contaminate our water. Firstly, most are constructed on areas of unspoilt moss, heather and deep peat, often with associated forestry. Construction vehicles churn up the ground to make access roads and clear the forests (approximately 3 million trees were cleared at Whitelee). Trees are pulled up, and the churned up peat is washed into the river systems by heavy rain, releasing excessive carbon which the water treatment works are not able to deal with. “The construction teams then blast quarries and ‘borrow-pits’ to provide rock foundations for access roads and turbine bases - six quarries with 85 articulated dump lorries ferried almost 6 million tons of excavated rock around the Whitelee site for roads and turbine foundations. These excavations allow access to the numerous faults (fractures) and dykes (intrusions) which crisscross Scotland and act as conduits for ground water. Chemical and diesel spills, therefore, have an immediate channel to the aquifer. It is also a great irony that anti-fracking campaigners make spurious claims about potential water pollution and then support the construction on industrial wind turbines, which are demonstrably causing widespread pollution to our water supplies in Scotland. “The evidence of pollution discovered by radiologist Dr. Rachel Connor stems from her own experience of living close to Whitelee, the largest windfarm in Europe, and experiencing first-hand the results of drinking contaminated water. Evidence of pollution was discovered in monitoring reports which were a requirement for the Whitelee windfarm construction 2006-2009 and were brought before a Public Inquiry re a 3rd extension to Whitelee, where Dr. Connor underwent a 5 hour cross examination. (This material has not yet been ruled on by the Scottish Government.) It included a failure to monitor and test for instances of specific contamination related to chemical spill or diffuse contamination from dangerous chemicals- some of which may have come from 160,000 m3 of concrete which were used in turbine foundations and other areas. “There was also evidence of contamination of private water supplies where springs had failed completely, boreholes had silted up temporarily and water quality was rendered unfit to drink. There is no effective protective mechanism for private water supplies if the local authority responsible for protecting the water supply has no mechanism to insist that a developer find, chart and protect the water source, and is subsequently not responsible for the hydrological environment upon which that water supply depends. “Windfarm developments have not been monitored or assessed according to the legal requirements which under a European Directive require Member States to ensure the establishment of programmes for the monitoring of water status in order to establish a coherent and comprehensive overview of water status within each river basin district. It is clear that incidents and concerns have been reported by a Planning Monitoring Officer to the regulatory authorities but have not been investigated. Indeed Planning Monitoring Officers are not routinely employed and in any case, information from such officials may be difficult and costly for the public to access. Consequently developments proceed unchallenged. “Now Scottish Water test results from 2005 to 2014 for colour, iron, manganese, coliforms and e coli in Loch Bradan, Afton Reservoir and Penwhapple Reservoir (see chapter 4.5)– also show a deterioration in water quality associated with windfarm construction and pre-construction forestry clearance. This means that many people in East and South Ayrshire are drinking water below the Drinking Water Regulatory Standards. Where water quality has fallen consistently below regulatory standards, statutory authorities have not informed the public of the potential risks to their health despite an EC Directive that insists ‘Member States shall ensure the necessary protection for the bodies of water identified with the aim of avoiding deterioration in their quality in order to reduce the level of purification treatment required in the production of drinking water’. “As Whitelee is Scottish Power Renewable’s flagship windfarm, the credibility of all their windfarm developments is based on the belief that their professed mitigation measures are successfully preventing any water pollution. How can the public be confident that this is the case if they do not constantly and consistently monitor all subsequent developments with results made easily available to the public? Susan Crosthwaite, of Cosses Country House, Ballantrae, Ayrshire KA26 0LR is calling for a Request for Action’ under Article 12 of The Environmental Liabilities Directive. Cosses Country House, a business dependent on rural tourism within the UNESCO designated Galloway and Southern Ayrshire Biosphere is sited in the vicinity of the River Stinchar protected drinking water catchment zone. "It is clear from this extensive and well-researched report prepared by Susan Crosthwaite that under pressure from the SNP Government at Holyrood, statutory authorities like SEPA, Scottish Water and Scottish councils, have simply ignored EU environmental legislation designed to protect our water. 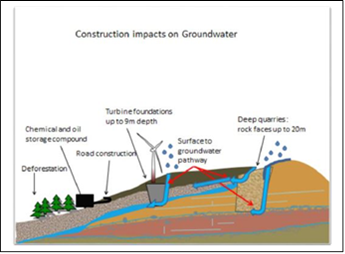 The Environmental Liabilities Directive and the Water Framework Directive have been repeatedly breached in Scotland in the race to erect giant wind turbines and fulfil the SNP's obsession with turning Scotland into the 'Saudi Arabia of renewables'.Now we have direct evidence that this has led to serious contamination of groundwater in the vicinity of industrial wind farms, causing consequent dangerous pollution to our drinking water. It is ironic that the same people who vigorously oppose fracking because they claim it will cause water pollution, enthusiastically support wind farms which demonstrably do cause water pollution, as well as defacing our landscape. I would urge the European Commission to take immediate action against the Scottish Government for allowing these serial breaches of EU directives to continue unchallenged." Note: Struan Stevenson was a Conservative MEP for Scotland from 1999 to 2014. He is the author of 'SO MUCH WIND - The Myth of Green Energy". Rüzgar türbini karşıtı kampanya katılımcılarından Susan Crosthwaite, Nehir havzası bölgelerindeki TÜM iskoç rüzgar santrali yapımlarının yol açtığı yüzey ve yeraltı suyu kirliliğine ilişkin acil ve tamamen bağımsız bir inceleme başlatılması çağrısında bulunuyor. Dev rüzgar türbinlerinin su tutma alanlarının sanayileşmesine yol açtığı, ki bunun da su kalitesi ve toplum sağlığına zarar verdiği ortaya çıkmıştır. Susan ilgili uygulamanın İskoç su kaynakları, kıyı girintileri ve özel su kaynaklarının tamamen korunmasına sadık kalınacak şekilde yapılmasını talep ediyor. “İskoçya'da rüzgar santrali yapımları Çevresel Sorumluluk Direktifi ve Su Çerçeve Direktifi'ni açıkça ihlal ediyor. Santralleri yapanlar ve devlet kurumları, yüzey ve yeraltı sularına dair riskler olduğunu tamamen bilmelerine karşın bu süreçlerin devamına izin veriyor. SEPA, Scottish Water, Konseyler ve İskoç Hükümeti gibi yetkili makamlar yasal suyu koruma görevlerini yerine getirmiyor. Sivil toplum yetkilileri, sürecin bu Direktif'in çerçevesinde uygun gerçekleştirilmesi ve yürütülmesini sağlamalıdır. “İnsanlar rüzgar santrallerinin suyu nasıl kirletebildiğini merak ediyor. Öncelikle, bunların büyük bir kısmı, çoğu orman bağlantılı bozulmamış yosun, süpürge otu ve yoğun turba alanlarına yapılıyor. İnşaat makineleri yol açmak ve ormanları açmak (Whitelee'de yaklaşık 3 milyon ağaç kesildi) için toprağı kaldırıyor. Ağaçlar yerinden sökülüyor ve topraktan sökülmüş olan turba (bataklık kömürü), yoğun yağmurla birlikte ırmağa dökülüyor; ki böylece de su arıtma yöntemleriyle temizlenemeyecek aşırı karbon salımı gerçekleşiyor. “İnşaat ekipleri daha sonra yol ulaşımı ve türbin temellerine kaya sağlamak için taş ocaklarını ve ariyet çukurlarını patlatıyor – Whitelee bölgesine yol ve türbin yapımı için altı taş ocağından 85 tır kamyonuyla yaklaşık 6 milyon ton kazınmış kaya taşındı. Bu kazılar pek çok fay (kırılma) ve hendek (su girişi) oluşmasına sebep oluyor ve dolayısıyla İskoçya'da çapraz hatlar oluşturarak yeraltı suyuna geçiş yapacak kanallar oluşmasına neden oluyor. Dolayısıyla su taşıma yollarına kimyasal ve dizel atıklar anında ulaşabiliyor. Hidrolik kırılma karşıtı kampanya katılımcılarının potansiyel su kirliliğine ilişkin göstermelik iddialarda bulunup sonra da gidip İskoçya'daki su kaynaklarımıza geniş çaplı çok büyük zarar veren endüstriyel rüzgar türbinlerindeki inşaatı desteklemeleri oldukça ironik. “Kirliliği keşfeden radyolog Dr. Rachel Connor, Avrupa'nın en büyük rüzgar santrali olan Whitelee'de evinin yakınında yaşadığı kendi tecrübesini kaynak gösteriyor ve kirlenmiş su içmenin sonuçlarını ilk elden paylaşıyor. Kirliliğe dair kanıtlar , 2006-2009 Whitelee rüzgar santrali yapımı için gerekli olan izleme raporlarında ortaya çıkarıldı ve Dr. Connor'ın 5 saatlik çapraz sorguya maruz kaldığı Whitelee'ye 3. bir uzantı olarak Kamu Soruşturmasına çıkarıldı. (Bu duruma ilişkin henüz İskoç Hükümeti tarafından karar verilmiş değil). Kimyasal atıklarla ilgili spesifik kirlenme veya tehlikeli kimyasalların -ki bunların bazıları türbin temelleri ve diğer alanlarda kullanılan 160,000 m3 betondan geliyor- sebep olduğu geniş kirliliğe ilişkin numunelerin gözlemi ve testi yapılamadı. “Su kaynaklarının tamamen işlevsiz hale geldiği, kuyuların geçici olarak kum, çamur ve malzemeyle dolduğu ve su kalitesinin içilemez duruma geldiği yerlerde özel su kaynaklarının kirlenmesine ilişkin kanıtlar da mevcuttu. Eğer su kaynağını korumakla yükümlü yerel yetkililer herhangi bir teşebbüse su kaynağını bulup taslağını çizip koruması konusunda ısrarda bulunmadığı sürece -ki sonrasında da bu su kaynağının bağlı olduğu hidrolojik ortamdan sorumlu olmayacak- bu özel su kaynaklarını koruyacak hiçbir etkili mekanizma mevcut değil. “Rüzgar santrali yapanlar, bir Avrupa Direktifi kapsamında üye devletlerin her bir nehir havzasındaki su durumunu gözlemlemek üzere uygun ve kapsamlı bir genel bakış oluşturmak adına program sağlamalarını gerektirecek yasal gerekliliklere göre gözlemlenmemekte ve değerlendirilmemektedir. İlgili vaka ve endişelerin uygulayıcı makamlara Planlama Gözlem Memuru tarafından rapor edildiği, ancak bunların soruşturulmadığı açıktır. Aslında Planlama Gözlem Memurları rutin olarak iş verilen kişiler değildir, ve bu kişilerden gelen bilgilerin kamuya ulaşması zor ve masraflı olabilir. Sonuç olarak bu santraller denetimsiz olarak rahatça yapılıyor. “Rüzgar santrali yapımı Amlaird'de ve diğer İskoç Su arıtım işlerinde ham su renginde artışla karşılaştı. Scottish Water (İskoç Su Kurumu) test sonuçları suyun renk, demir, manganez, koliform, E coli bakterisi ve bulanıklığında artış olduğunu gösterdi ancak bunlar araştırılmadı ve uygun yetkililerce çözüldü. Bu dezenfeksiyon prosedürleri içme suyunun Avrupa ve İngiltere düzenleyici standartlarına uygun olmadığı, ve Dünya Sağlık Örgütü'nce kanserojen olarak tanımlanan Trihalometanlar seviyesinde artışa yol açtığı anlamına geliyordu. “Bradan Gölü, Afton ve Penwhapple Su Kaynakları'nda 2005-2014 yılları arasında renk, demir, manganez, koliform ve e coli bakterisine ilişkin test sonuçları, rüzgar santrali inşaatı ve inşaat öncesi ormanların tahrip edilmesiyle ilgili olarak su kalitesinde de kötüleşme olduğunu gösterdi. Bu şu anlama geliyor; yani Doğu ve Güney Ayrshire'de pek çok insan İçme Suyu Düzenleyici Standartları'nın altındaki suyu içiyor. Su kalitesinin standartların altına düştüğü yerlerde yetkililer, “Üye Devletler bu Direktifin uygulanması için aldıkları önlemlerin hiçbir şekilde insani kullanım amaçlı suyun insan sağlığının korunmasıyla ilgili mevcut kalitesinin bozulmasına yada içme suyu üretimi için kullanılan suların kirlenmesinde herhangi bir artışa neden olmasına doğrudan ya da dolaylı olarak neden olacak şekilde uygulanmamasını sağlayacaklardır.” maddesini içeren AB Konseyi Direktifi'ne rağmen, halkı sağlıklarına ilişkin bu olası riskler hakkında bilgilendirmiyor. “Whitelee, Scottish Power Renewable'ın (İskoç Yenilenebilir Enerji) en iyi rüzgar santrali olarak gösterildiği için, onların aldığı sözde azaltıcı önlemlerin su kirliliğini başarıyla önlediği inancı hakim. Halkın kolaylıkla ulaşabileceği bu sonuçları ve sonrasında yaşanan gelişmeleri sürekli ve tutarlı olarak izlemiyorlarken, halk durumun böyle olduğuna nasıl güven duyabilir? Cosses Country House, Ballantrae, Ayrshire KA26 0LR'den Susan Crosthwaite, Çevresel Sorumluluk Yönergesi'nin 12. Maddesi uyarınca Eylem Talebinde bulunuyor. Cosses Country House, UNESCO tarafından korumalı içme suyu tutma bölgesi olarak belirlenen Stinchar Nehri yakınında bulunan Galloway ve Güney Ayrshire'da kırsal turizme dayalı bir turizm işletmesi.